How is cow dung improving livelihoods and helping to protect wild tigers in central India? Dung. It’s not the first thing that comes to mind when you think about conservation, but this waste product is playing a crucial role in tackling human-wildlife conflict in central India, where Born Free’s Living with Tigers programme operates. Living with Tigers runs initiatives across the Satpuda area of central India to find compassionate solutions so that local communities can live peacefully alongside wildlife. One of these initiatives is a bio-gas scheme through which bio-plants powered by cow dung are constructed in homes to provide a free fuel source. The dung is converted into methane, which fuels two table-top burners for cooking. Living with Tigers maintains more than 1,000 bio-plants across Satpuda through its partners Satpuda Foundation and Bombay Natural History Society. “At Satpuda Foundation, we advise villagers on how to maintain the bio-gas system because it requires a little technical know-how. And if something goes wrong and there is a malfunction we will also help get it running again,” says Sumit Kar, Conservation Officer for Satpuda Foundation. The bio-gas scheme helps to protect wildlife in Satpuda by preventing deforestation. Satpuda Foundation estimates more than 600 trees a year have been saved because villagers are no longer felling trees for firewood. It also reduces human-wildlife conflict because villagers don’t have to enter the forest to collect firewood. Crucially, the scheme improves the livelihood of local communities too. 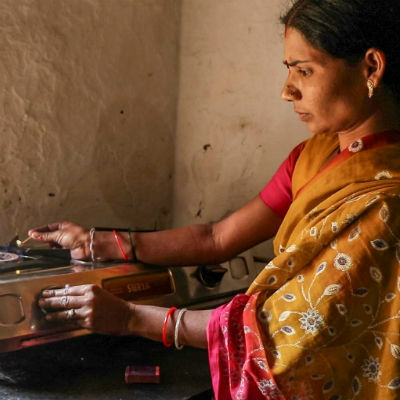 As well as providing them with a free and accessible fuel source, bio-gas saves an estimated ₹3,000-₹5,000 (£33-£55) a year versus LPG (Liquefied Petroleum Gas), according to Satpuda Foundation. It’s also a cleaner fuel source than burning firewood, which means local air pollution levels have reduced. Initiatives like the bio-gas scheme are happening right across Satpuda thanks to Born Free’s Living with Tigers programme. With your help, we can safeguard wild tiger populations and educate more people on the importance of conservation and approaches to co-existence.